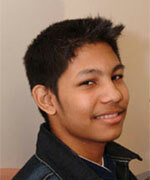 Pariksit Daby, one of the children that Herbie Fund has helped. It was discovered five years ago that Pariksit would need surgery to treat his heart disease. The family initially thought that Pariksit would go to England to have the operation, but the medical and travel costs were very high. The family knew of another child from Mauritius who had been helped by SickKids and Herbie Fund, so his aunt and uncle who live in Toronto researched the program on the Internet. They then applied for Pariksit to come to Toronto. When Pariksit arrived to Toronto at the end of March 2004, he was ill from travel and his operation had to be postponed. He had his surgery on April 12 and was discharged three days later and returned to Mauritius, a much healthier, happier and far more active child.